The events have since become a highly mythologized and symbolic story of the Wild West, and over the years variations of the storyline have come to include some of its most famous historical figures. In addition to being one of the most well-known range wars of the American frontier, its themes, especially class warfare, served as a basis for numerous popular novels, films, and television shows in the Western genre. Conflict over land was a common occurrence in the development of the American West, but was particularly prevalent during the late 19th century, when large portions of the West were being settled by white Americans for the first time through the homesteading act. It is a period which historian Richard Maxwell Brown called the "Western Civil War of Incorporation",  of which the Johnson County War was a part. In the early days of Wyoming most of the land was in public domain, which was open to stock raising as an open range and farmlands for homesteading. Large numbers of cattle were turned loose on the open range by large ranches. Each spring, round-ups were held to separate the cattle belonging to different ranches. Before a roundup, an orphan or stray calf was sometimes surreptitiously branded, which was the common way to identify the cow's owners. Lands and water rights were usually distributed to whoever settled the property first, and farmers and ranchers had to respect these boundaries (the doctrine was known as Prior Appropriation). However, as more and more homesteaders called "grangers" moved into Wyoming, competition for land and water soon enveloped the state, and the cattle companies reacted by monopolizing large areas of the open range to prevent newcomers from using it. They also forbade their employees from owning cattle for fear of additional competition, and threatened anyone they suspected to be rustlers. The often uneasy relationship between the larger, wealthier ranches and smaller ranch settlers became steadily worse after the harsh winter of 1886–1887, when a series of blizzards and temperatures of –50 to –40 °F (–45 to –40 °C) followed by an extremely hot and dry summer, ravaged the frontier. Thousands of cattle were lost and the large companies began appropriating land and the water supply in the area. Some of the harsher tactics included forcing settlers off their land, setting fire to their properties, and excluding them from participating in the annual roundup. They justified these excesses on what was public land by using the catch-all allegation of rustling. Hostilities worsened when the Wyoming legislature passed the Maverick Act, which stated that all unbranded cattle in the open range automatically belonged to the cattlemen's association. The cattlemen also held a firm grip on Wyoming's stock interests by limiting the number of small ranchers that could participate. Many of the large ranching outfits in Wyoming were organized as the Wyoming Stock Growers Association (the WSGA) and gathered socially at the Cheyenne Club in Cheyenne, Wyoming. Comprising some of the state's wealthiest and most influential residents, the organization held a great deal of political sway in the state and region. The WSGA organized the cattle industry by scheduling roundups and cattle shipments. The WSGA also employed an agency of detectives to investigate cases of cattle theft from its members' holdings. In March 1892, the cattlemen sent agents to Texas from Cheyenne and Idaho to recruit gunmen and finally carry out their plans for exterminating the homesteaders. The cattle barons have always used hired guns from Texas to take out suspected rustlers and scare away the nesters in Wyoming. One particular act of violence perpetrated by the Texans was recounted by cowboy John J. Baker, where the Texans ambushed and killed nine trappers whom they mistook for rustlers in Big Dry Creek, Wyoming. They received a $450 bonus for the slaughter. John Clay, a prominent Wyoming businessman, was suspected of playing a major role in planning the Johnson County invasion. Clay denied this, saying that in 1891 he advised Wolcott against the scheme and was out of the country when it was undertaken. He later helped the "Invaders" avoid punishment after their surrender. The group organized in Cheyenne and proceeded by train to Casper, Wyoming and then toward Johnson County on horseback, cutting the telegraph lines north of Douglas, Wyoming in order to prevent an alarm. While on horseback, Canton and the gunmen traveled ahead while the party of WSGA officials led by Wolcott followed a safe distance behind. The first target of the WSGA was Nate Champion, who was at the KC Ranch (also known as Kaycee) at that time. They were tasked to perform the assassination that others had failed to carry out five months before. The group traveled to the ranch late Friday, April 8, 1892, quietly surrounded the buildings, and waited for daybreak. Three men besides Champion were at the KC. 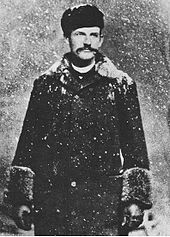 Two men who were evidently going to spend the night on their way through were captured as they emerged from the cabin early that morning to collect water at the nearby Powder River, while the third, Nick Ray, was shot while standing inside the doorway of the cabin. As the gunmen opened fire on the cabin, Champion dragged the mortally wounded Nick Ray back to the cabin. The latter died hours later, and Champion was left besieged inside the log cabin alone. The sheriff's posse finally reached the remaining Invaders holed up in a log barn at the TA Ranch, but the latter manage to hold them back, resulting in a siege that would last for three days. The posse surrounded the whole ranch, building pits on the ground for cover and killing the Invaders' horses to prevent them from escaping. The New York Times reported that twenty men tried to escape behind a fusillade, but the posse beat them back and killed three to five. Another Texas gunman named Alex Lowther accidentally shot himself mortally in the groin as he was crawling to safety from the barrage of bullets being fired by the settlers. As the siege dragged on, a settler rode off to Fort McKinney requesting to borrow a cannon but was turned down. A blacksmith named Rap Brown tried to build his own cannon, but it exploded when he first tested it. He then built a siege engine he called the "Ark of Safety"—a large, bullet-resistant wagon that would help the settlers get close to the ranch so they could throw dynamite at the Invaders. Fortunately for the Invaders, one of their members, Mike Shonsey, managed to slip from the barn and was able to contact Governor Barber the next day. Frantic efforts to save the WSGA group ensued, and two days into the siege, late on the night of April 12, 1892, Governor Barber telegraphed President Benjamin Harrison a plea for help. About sixty-one owners of live stock are reported to have made an armed expedition into Johnson County for the purpose of protecting their live stock and preventing unlawful roundups by rustlers. They are at 'T.A.' Ranch, thirteen miles from Fort McKinney, and are besieged by Sheriff and posse and by rustlers from that section of the country, said to be two or three hundred in number. The wagons of stockmen were captured and taken away from them and it is reported a battle took place yesterday, during which a number of men were killed. Great excitement prevails. Both parties are very determined and it is feared that if successful will show no mercy to the persons captured. The civil authorities are unable to prevent violence. The situation is serious and immediate assistance will probably prevent great loss of life. The barn at the TA Ranch, where the "regulators" were besieged by the sheriff's posse. The text of Barber's telegram to the President was printed on the front page of The New York Times on April 14,  and a first-hand account of the siege at the T.A. appeared in The Times and the Chicago Herald and other papers. Ella Watson was lynched in 1889 by wealthy ranchers who accused her of cattle rustling, a charge that was later shown to be false. Emotions ran high for many years afterward. Some considered the large and wealthy ranchers as heroes who had sought what they regarded as justice by using violence to defend what they regarded as their rights to rangeland and water rights, while others saw the WSGA as heavy-handed outlaw vigilantes running roughshod over the law. A number of tall tales were spun by both sides afterwards in an attempt to make their actions appear morally justified. Parties sympathetic to the invaders painted Ellen Watson as a prostitute and cattle rustler, Jim Averell as her murderous partner in crime and pimp and Nate Champion as the leader of a vast cattle rustling empire, claiming that he was a leading member of the fabled "Red Sash Gang" of outlaws that supposedly included the likes of the Jesse James gang. These claims have since been discredited. 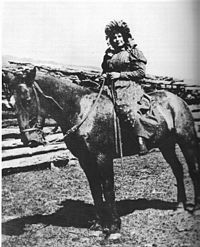 While men frequently visited Watson's cabin, this was because she mended clothing for cowboys to earn extra money. While some accounts do note that Champion wore a red sash at the time of his death, such sashes were common. While the Hole in the Wall Gang was known to hide out in Johnson County, there is no evidence that Champion had any relationship to them. Parties sympathetic to the smaller ranchers spun tales that included some of the West's most notorious gunslingers under the employ of the Invaders, including such legends as Tom Horn and Big Nose George Parrot. Horn did briefly work as a detective for the WSGA in the 1890s, but there is little evidence he was involved in the war. By 1893, the WSGA was opened to the other small ranchers and farmers, finally ending their monopoly and control over Wyoming business interests. Previous practices of the WSGA, such as vigilantism and confiscation of cattle, were finally stopped. Many prominent leaders of the Association such as Frank Wolcott, Frank M. Canton and Tom Smith later left the area. The story of the Johnson County War from the point of view of the small ranchers was chronicled by Kaycee resident Chris LeDoux in his song "Johnson County War" on the 1989 album Powder River. The song included references to the burning of the KC Ranch, the capture of the WSGA men, the intervention of the U.S. Cavalry and the release of the cattlemen and hired guns. 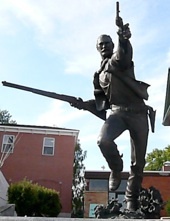 The Jim Gatchell Memorial Museum in Buffalo featured dioramas and exhibits about the Johnson County War, as well as a 7-foot (2.1 m) bronze statue of Nate Champion. 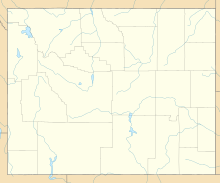 Kaycee, Wyoming, the old site of the KC Ranch, also erected the Hoofprints in the Past Museum to commemorate the war. ^ "Spell of the West: Johnson County War". JCS Group. ^ "Wyoming Legends: Johnson County War". Legends of America. Retrieved April 3, 2015. ^ a b "Wyoming Cattlemen on a Campaign against Thieves". The New York Times. April 1, 1892. ^ a b c d e f Davis, John W. "The Johnson County War: 1892 Invasion of Northern Wyoming". Wyoming History. Retrieved April 3, 2015. ^ a b c d "Wyoming's Wild Past". Occidental Wyoming. Retrieved April 3, 2015. ^ "Jim Averill & Ella Watson (Cattle Kate)". The Spell of the West. Retrieved April 5, 2015. ^ Simkin, Jim (1997). "Albert Bothwell". Spartan Educational. Retrieved April 5, 2015. ^ a b c Dolson, G. B. "Johnson County War" Wyoming Tales and Trails Archived 2014-01-08 at the Wayback Machine January 6, 2004. ^ "Johnson County War". JCS Group. Retrieved April 5, 2015. ^ Boardman, Mark. "Wave of Violence". True West Magazine. Retrieved May 22, 2017. ^ a b Inventory of the Johnson County War Collection Texas A&M University - Cushing Memorial Library"
^ "The Johnson County War (Wyoming) 1892". BBC. Retrieved February 2, 2014. ^ Griske, Michael (2005). The Diaries of John Hunton. Heritage Books. pp. 122, 123. ISBN 0-7884-3804-2. ^ Herring, Hal. "The Johnson County War: How Wyoming Settlers Battled an Illegal Death Squad". Field and Stream. Retrieved February 2, 2014. ^ a b c d The New York Times " The Trouble In Wyoming". April 14, 1982. ^ "Michael Shonsey". Find A Grave. Retrieved June 29, 2017. ^ Brooke, John R. " No Title", The New York Times, April 15, 1892. ^ Petrimoutlx, Jim. "U.S. Marshal George A. Wellman (1858-1892)". Bay Journal. Retrieved April 3, 2015. ^ Kraft, Louis (2000). Gatewood & Geronimo. University of New Mexico Press. p. 166. ISBN 978-0-8263-2130-5. ^ a b Dolson, G. B. "Johnson County War" Wyoming Tales and Trails January 6, 2004. ^ a b "History: The Range Wars Of The Old American West". Feral Jundi. February 6, 2010. Retrieved February 2, 2014. ^ Homsher, Lola M. Archives of the Wyoming Stock Growers' Association, The Mississippi Valley Historical Review, Vol. 33, No. 2. (September 1946), pp. 281. ^ Wister, Owen (1998). The Virginian. Oxford, NY: Oxford University Press. p. 48. ISBN 0-19-283226-3. ^ "Johnson County War (2002)". New York Times. April 3, 2015. Retrieved February 2, 2014. ^ West, James (May 16, 2011). "Jean Parker: Movie Star". www.IndianaMilitary.org. Retrieved May 5, 2015. ^ "Blood Feuds Episode Guide". TV Guide. ^ "Parole Johnson County War Chris LeDoux". Great Song. Retrieved February 2, 2014. Sandoz, Mari (1956). The Cattlemen. New York: Hastings House. ISBN 0803810873. Smith, Helena Huntington (1967). The War on Powder River. Lincoln, NE: University of Nebraska Press. ISBN 0803251882. O'Neal, Bill (2004). The Johnson County War. Austin, TX: Eakin Press. ISBN 1-57168-876-5. Davis, John W. (2010). Wyoming Range War: The Infamous Invasion of Johnson County. Norman, OK: University of Oklahoma Press. ISBN 978-0-8061-4106-0.